Situated in the Aegean, Lesvos is well connected by air and sea to Athens, Thessalonika and other Ionian Islands. Quaint fishing villages and pale sandy beaches encircle this delightful destination, with olive groves and pine trees defining the interior. Mitilini is the main town. 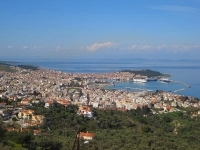 However, most holidaymakers head for the northern village of Molivos, and the south coast town of Plomari. Sigri is also popular, given its location near the world's largest petrified forest. Apart from beautiful, secluded beaches and superb opportunities for walking and bird-watching, Lesvos has relics of a long and proud history. Indeed, the island has been inhabited since the Bronze Age, and rose to glory around the 6th century BC, when only Athens rivalled it as a centre of civilisation. Classicists know Lesvos as the ancient poet Sappho's birthplace. Travellers recognise Lesvos as a gay-friendly island.